The challenge, taking place in the beautiful Exmoor National Park in Somerset on 11 June 2011, will see teams from across the industry covering the distance of a marathon in a day by foot, bike and canoe, with mystery challenges thrown in plus a one-hour bonus stage for the super fit and ultra competitive. The challenge, offers participants an unusual, fun way of testing themselves personally, as well as providing a refreshing and imaginative brand of team building amongst colleagues. The event follows on from the successful partnership between CARE and Computer Weekly for the annual CARE IT Three Peaks Challenge which has raised tens of thousands of pounds over the past three years. CARE challenge manager Neil Munro said, "Computer Weekly has kindly supported CARE IT Challenge events for the past three years. This is the first Adventure Challenge of its kind for the industry - it's something new and we're very excited about it. The event will include mountain biking in scenic Exmoor, canoeing on Wimbleball Lake and a spectacular trail challenge. Team members will have the opportunity to train, fundraise and complete the challenge together, and there's a huge sense of achievement - not least because the funds raised will support CARE's essential work overseas." Previous CARE events have attracted teams who work in IT from a wide range of companies, including Barclays, Accenture, Harvey Nash, ACAS, QA, Rugby Football Union, Ixion Holdings and many more. Munro is confident this year's event will be as popular with the IT industry as previous CARE challenges. 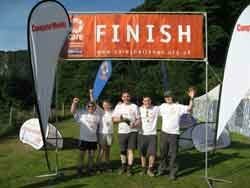 "The CARE IT Adventure Challenge is one of the most fun and unusual challenges in our calendar. We're hoping to raise £60,000 to support CARE's work so we urge teams to get signed up for a very enjoyable challenge for an important cause," he said. CARE's Challenge Team offer participants expert advice on training and fundraising. The final challenge of the event will be summoning enough energy for the post-event dinner and party where teams can toast the top fundraisers and celebrate a great achievement by taking to the dance floor. CARE has even launched www.lendwithcare.org, a website allowing individuals in the UK to select an entrepreneur from a poor community to invest in. This is the kind of work teams' efforts will support through the CARE IT Adventure Challenge.